Attention all club members: Our adult classes will continue to be held every Monday & Thursday night 7:30-9pm throughout the summer unless otherwise posted on our Facebook page. Our teen class will continue to run until July as we have 2 students preparing for nationals, we encourage any of our members who’s membership was paid in full for the 2012/13 season wishing to stay active to attend these classes @ no charge. For new members please feel free to attend classes, we can customize a summer membership for anyone. 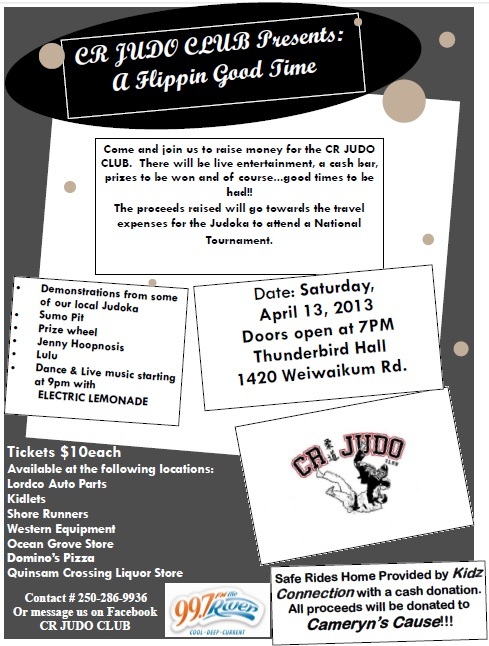 CR JUDO ClUB Presents: A flippin good time! The competitor sign up sheet is on the bulletin board in our dojo. Sensei Yule has posted a volunteer sign up list in the dojo , please sign up for at least one thing: Concession, Time keeping, head table; First AId, etc. The CRJC is holding our 2012 Annual General Meeting Tuesday November 20 @ the dojo starting at 6:30pm. Please attend this event and see how the club is ran. The Fall Judo season starts Monday September 10 and runs until December 20. The CRJC invites new members all season long, e-mail us or show up 5 minutes early to a class to find out more details. We are excited to announce our Fall schedule is up! We have tweaked the class configurations to better serve everyone. The CRJC will be holding registration on the following 3 days…. Monday August 27 & Wednesday August 29 @ the Dojo 6-7:00pm. All past students are welcome to attend a group workout these nights. Wednesday September 5 we will hold a registration & Judo fun night with games for all new and past students 6-8:00pm. At the 3 registration nights we will be offering 10% off all in stock & pre-ordered Judo gis. Regular classes start Monday September 10, see everyone on the tatami! Stay tuned for our upcoming 2012 season schedule! Our instructors are currently in discussions regarding potential new classes and class times. The new schedule will be published at the end of July. Burger & Beer Fundraiser March 8! We are holding a burger & beer fundraiser on March 8, 2012 from 5:30-8:30pm at the Riptide Pub. Tickets are $15.00 each, the burger comes with lettuce, red onion, tomato, mayo, mustard & relish. There will be a choice of caesar salad or fries as well as a sleeve of beer. There will also be a 50/50 & chinese auction with many raffle items being donated by the generous business’ of Campbell River. This is the CRJC’s biggest fundraiser this year so please show your support and join us for an evening of good food and good times!